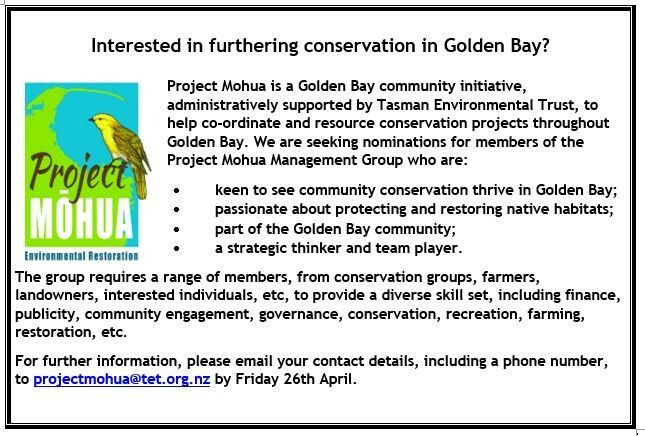 Project Mohua is an opportunity for you to help shape a Trust that will work to restore or look after all the native plants and animals that make the Bay unique. 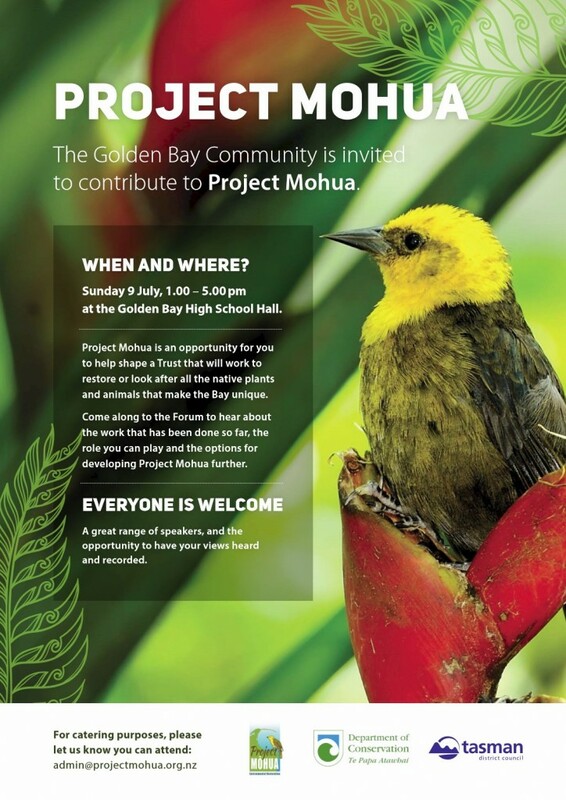 Come along to the forum to hear about the work that has been done so far, the role you can play and the options for developing Project Mohua further. A great range of speakers, and the opportunity to have your views heard and recorded. Click to email us about the workshop. Driving up the Takaka Hill on State Highway 60 you can't help but notice the vines of Old Man's Beard and Banana Passion fruit that cover the trees. Both major plant pests, they slowly smother and kill all plants including the tallest trees, prevent the establishment of native plant seedlings, and Banana Passionfruit Vine (BPV) fruit encourages pest animals such as possums and rats. Because of the height of the vines, seeds can be picked up by strong winds and blown into the Abel Tasman National Park, where seedlings have already been found. In recent years Project De-Vine Trust has received frequent complaints about the vines on the hill and the lack of control work undertaken. Project De-Vine is committed to removing the pest vines and other plants from the area known as the Halo, which surrounds the Abel Tasman National Park. State Highway 60 makes a convenient edge to the Halo. Project De-Vine along SH60, will carry out this work from below the Riwaka Resurgence turn off to the Ravensdown Lime quarry, commencing mid-February. The work will take approximately three weeks, unless there are delays due to weather. Travelling to the Abel Tasman National Park without seeing large curtains of these vines will enhance the view, as well as the perception of how we are managing this special part of the Tasman region. If you require more information, you can view our website http://projectde-vinetrust.org.nz. Click to email us for more information. Friends of Mangarakau Swamp invite you to their annual weekend working bee and AGM. achievements of the past year. food for breakfast, lunch and shared evening meals. Click here for details of how to get there. For more information contact Robyn robyn@robyn-jones.com or 03 5248266.